I think this block a very interesting one, ever since I first saw it in Laurie Hird’s book. It is somehow very plain, with only two colours and the geometric forms. But still, I can’t stop looking at it. There are the two maple leaves, blue in my case. And then there is this second form, two arrows pointing out of the picture. If you would turn these arrows by 180 degree, the leaves will become arrows too, and then you would have four arrows pointing to the middle. When browsing for other quilters’ examples of the Ozark Maple Leaf block, I found quite a number of blocks where the quilter had chosen to have rather four arrows—pointing to the middle or to the corners—than having a single leaf. 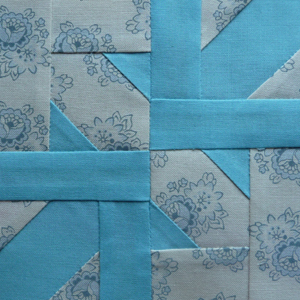 Maybe having four arrows is the better solution, since a traditional maple leaf block is featured in the Farmer’s Wife sampler as well. Anyway, I like the Ozark Maple Leaf block far better than the traditional block. I think it has a somewhat fresher, more modern look. Of course, I wanted to find out what “Ozark” means. I looked it up at wikipedia, but still am a little bit clueless. Apparently, it is a county in Missouri, and a mountain plateau, but I couldn’t find out if there is maybe a special type of maple tree that only grows in these woods or something like that. I did find out, however, that the Ozark Maple block is a rather antique geometric quilt design—but not looking in the least fusty! Posted in Uncategorized and tagged farmer's wife, farmer’s wife quilt, ozark maple leaf, ozark maple leaf block, quilt, quilt block. Bookmark the permalink.